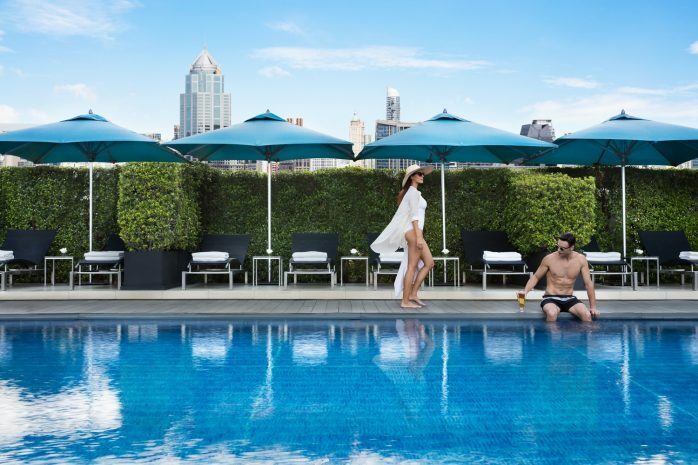 Whether you’re a Bangkok resident on staycation or a traveler from the other end of the world, your holiday truly begins when you rest or play beside the irresistible turquoise waters of the outdoor pool. This relaxing oasis, framed by a wall of lush greenery, seems to hover among the city’s skyscrapers. On the vast wooden terrace, settle into a comfortable sun lounger or intimate cabana to catch your breath after a few laps or to prolong the sense of wellbeing after a session in the whirlpool. Select a cocktail or smoothie from Liquide Pool Bar’s fan-shaped menu, which features a wide range of delights to tempt your tastebuds.